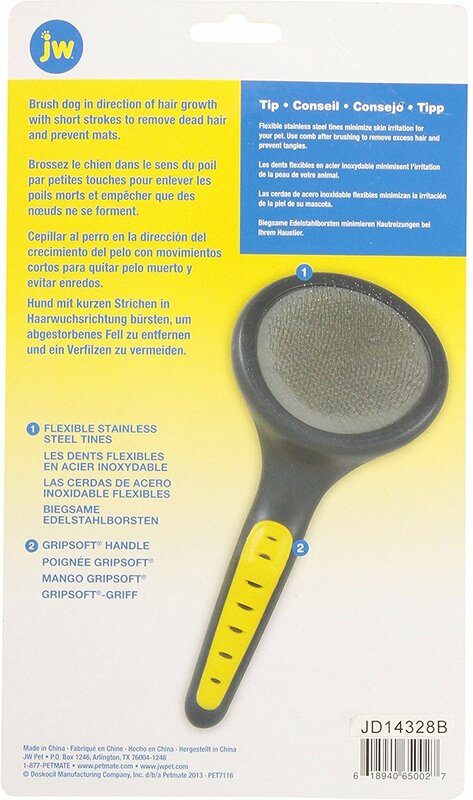 JW Pet Gripsoft Slicker Brush Soft Pin comes equipped with a rubber-sheathed handle design, which offers extreme comfortability and precision. This Gripsoft technology features non-slip grips which are made to optimize comfort and control while grooming your furry friend. The complete Gripsoft line offers a variety of designs specifically made to address each of your pet's needs to ensure a beautifully soft and shiny coat. Metal teeth in two different lengths lift shedding hair from the undercoat and loosen lightly matted portions of fur. The teeth are turned 90 degrees away from the skin keeping them parallel to the skin to prevent "raking" the skin and make grooming more comfortable for your dog. 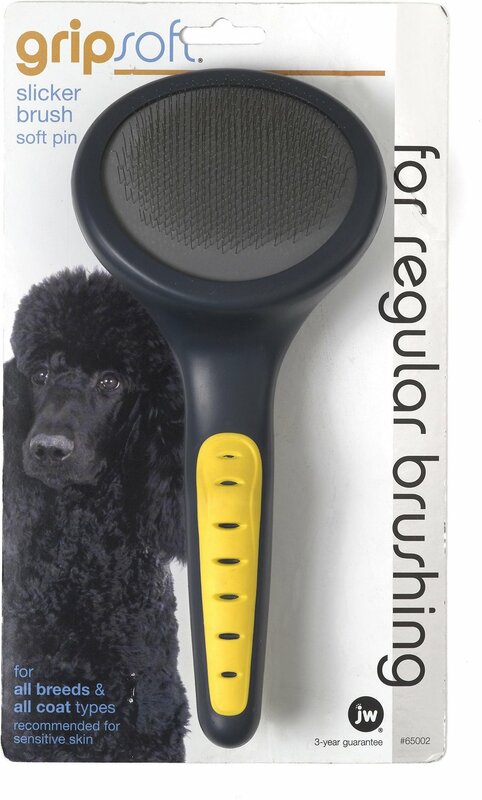 Brush dog in direction of hair growth with short strokes to remove dead hair and prevent mats. Use comb after brushing to remove excess hair and prevent tangles. For best results, use brush daily to ensure a beautifully soft and shiny coat. We offer a warranty on select Petmate products. Any applicable warranties will be outlined on that product’s detail page. For more information, select the “warranties” dropdown in the contact us link in the footer. 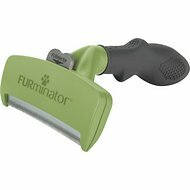 Can I buy replacement parts for my Petmate products that I already own? How do I know what size to buy for my pet? Each product page will have sizing information for the type of pet the product is typically purchased for. On many items, we use weight as the key product differentiator, so if you know how much your pet weighs, that will be a good starting place. My Jack really like this slicker brush alot when I get the slicker brush out of the drawer I put it on the little table Jack will bring it to me and then i brush he with it, then when I'm done he just looks at me like to say your done already so I tell him let's go put up your brush up Jack and then he is ok with that. Best slicker I have found to use on my poodle. I have two poodles and using this brush has cut down on brushing time. My one poodle didn’t like the last slicker I got and would try to run away. With this brush she just lays there and let me brush her. Would definitely get another one. My little dog isn’t crazy about the brush, but it works really well on her coat! I use her Detangler and that is a life saver for me and her. Makes getting through her hair so much easier with this brush! I bought this brush for my kitty who has very sensitive skin and long hair but it doesnt seem to be working very well . I brush her but it doesn't seem to be picking up very much hair . I didn't realize this brush was so huge but it's ridiculous for use on a 6lb dog. My mistake for not researching before ordering but it does say "for all breeds". Probably just fine for bigger breeds but it's not helpful for a little pom. I had to get a smaller one.